Kurber Construction would like to thank the many Wisconsin families and businesses who have helped them reach their five year milestone. Kurber Construction LLC is proud to announce that this April the company is celebrating a five-year anniversary as a locally-owned home building and home remodeling business. 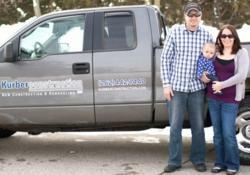 For home remodeling and home building, Waukesha and southeastern Wisconsin residents have turned to this family-owned and operated company since 2008, and for good reason. Owner Erick Kurber is a master carpenter who takes his craft seriously, so he doesn't just own his business — he personally completes each and every project Kurber Construction takes on.